When traveling over the holidays, travelers have come to expect that they will likely face crowds, long lines, and even delays. According to data reported by CheapOair®, the day before Thanksgiving is consistently ranked as one of the top three busiest travel days of the year. This year, the online travel agency and leading provider of cheap flights is offering some tips to help holiday travelers breeze through the airport. From the ride to the airport to the lines for security, passengers should plan on allowing extra time for Thanksgiving air travel. For starters, travelers should check-in online as soon as the option becomes available – typically 24 hours before departure. Next, comes ground transportation. Whether relying on family, friends, a cab, or public transit, travelers should remember that air travel isn’t the only transportation pain point during the holidays. Factors such as weather and time of day should be taken into consideration when evaluating the already congested roadways. Lastly, it is important to remember that everything at the airport takes longer on those extra busy travel days. Travelers should allot plenty of time for checking bags, clearing airport security, and getting to the gate. For busy travel days like Thanksgiving, travelers can expect to spend more time in the airport compared to a typical travel day. More time in the airport often means more time spent on mobile devices. Though many airports have started adding mobile-friendly amenities such as charging stations, it’s best not to count on these being available. Instead, CheapOair recommends that travelers charge up devices before heading to the airport and consider carrying a portable charging device, just in case. No one likes to be delayed, especially during the holidays. Before heading to the airport, travelers should double check with their airline to make sure there haven’t been any drastic updates to their flight. To eliminate the manual work, many airlines offer travelers the ability to opt-in for SMS updates while checking-in online. This allows updates to be automatically sent as they happen. In the case of a delay, it may be tempting to put off going to the airport. However, travelers should keep in mind that new departure times are estimates and can be moved forward if the cause of the delay has been resolved. If an extended delay or cancellation arises, CheapOair advises calling the airline’s customer support line instead of waiting for assistance at the airport. The agents on the phone are generally able to assist in the same way as the gate personnel. Thanksgiving air travel often means long lines, especially to drop-off baggage. With a little preparation and planning, travelers can limit their baggage and plan to carry-on rather than check their luggage. CheapOair suggests that travelers should verify to see what is included with their ticket before packing, keeping in mind that most Basic Economy fares do not include carry-on baggage. The battle with the masses might seem over after passing through airport security, but oftentimes the gate area can be just as crowded. Day passes to many airport lounges can be purchased for a fee and offer a calmer and more comfortable place to relax, plus complimentary food and drinks. CheapOair’s mission is to educate and aid consumers in both planning their travel and staying current on the most popular destinations. With a portfolio of travel products, including cheap airfares on over 450 global airlines, CheapOair is a great way to book the airline tickets that are right for you. CheapOair®, the leading flight-focused hybrid travel agency, today announced its top ten domestic and international destinations for Thanksgiving. While most American travelers will remain stateside for the holiday this year, there are some who will be traveling internationally to destinations including London, Tokyo, and Dublin. Historically, Thanksgiving travel results in approximately 20% of travelers going international while 80% stay domestic[i]. As of the first week of October, CheapOair’s international bookings for the holiday were well underway with initial data reporting a higher than normal percentage of international bookings at 29%[ii]. However, as Thanksgiving approaches, 2018 continues to track along the historical trend line. A more recent report shows that domestic bookings are rising, and data recorded in the third week of October shows the split moving closer to the norm with 26% being international and 74% being domestic bookings[iii]. In addition to popular tourist areas, such as New York and Los Angeles, CheapOair’s data shows three cities in Florida among the top ten U.S. destinations, with Orlando coming in at number two, Miami at number four and Ft. Lauderdale at the number six ranking. 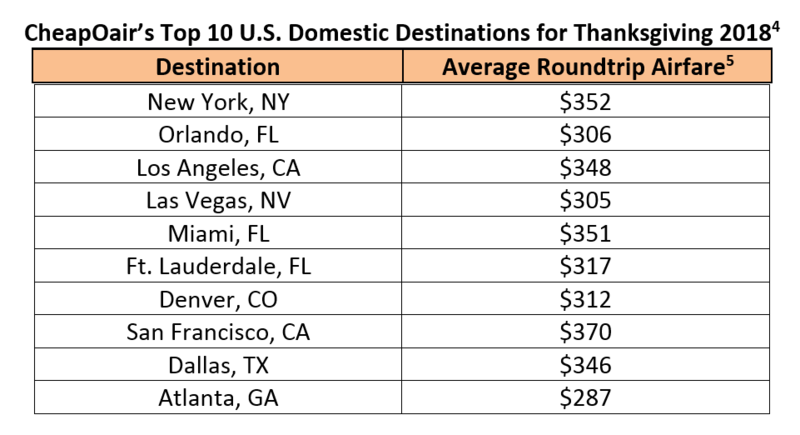 The average roundtrip domestic airfare for destinations on the top 10 list this year is $329, with the lowest fares to Atlanta, Las Vegas, and Orlando. 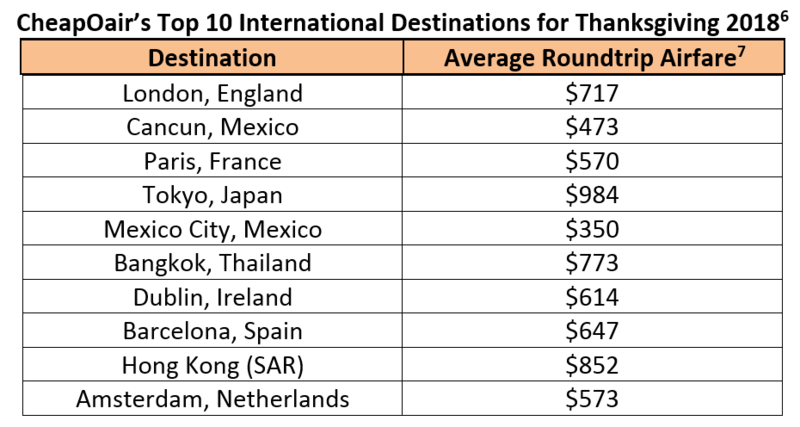 Internationally, although Cancun, Mexico lost the top ranking to London, England this year, it remains a top international destination for Thanksgiving travel. London’s boost in popularity may be a result of an 20% decrease in airfare pricing since 2017, while Amsterdam holds the largest drop in pricing from last year, at a whopping 50%[iv]. CheapOair’s mission is to educate and aid consumers and travel professionals in both planning their travel accommodations and staying current on the most popular destinations. With a portfolio of products, including rate and schedule information from 450 global airlines, CheapOair is a great way to book the travel that’s right for you. CheapOair is a flight-focused hybrid travel agency that enables consumers to book online, on mobile apps for iOS and Android, by phone (1-800-566-2345) or live chat. 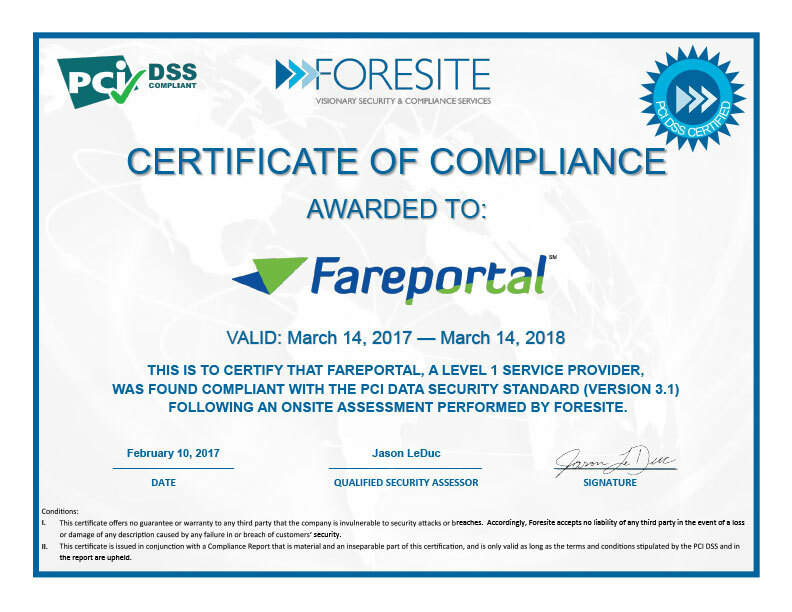 Part of Fareportal’s family of travel brands, CheapOair bridges the gap between an online travel agency and a traditional agency with certified travel agents available 24/7 to help find deals and offers to destinations worldwide on over 450 airlines, a million hotels, and 100s of car rental companies. Follow CheapOair on Facebook, Twitter, Instagram , and Pinterest to learn how to travel the world for less.